Eaton’s KeAnthony Bales pins his opponent from Covington during a dual match on Tuesday, Feb. 5. Eaton came up short on the scoreboard, falling 39-27. 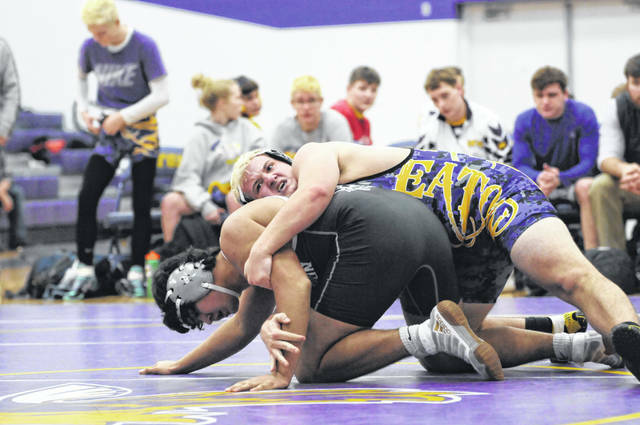 EATON — Eaton’s wrestling team capped off the regular season with one last home meet. “This was a night I knew we were going to have some really tough matches because three of their guys were state place winners last year. 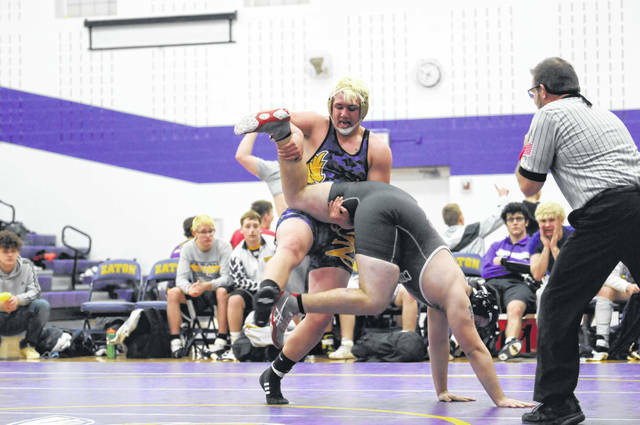 That just makes for some great learning experiences because that’s why you want to wrestle those kinds of teams,” Eaton coach Mark Silvers said. Eaton couldn’t overcome two forfeits at the two lightest classes and suffered a 39-27 setback on Tuesday, Feb. 5. The meet marked the final home contest for this year’s senior class. “I feel good about the seniors getting that one last meet in the home gym. There’s nothing like wrestling in your home gym. It really is good,” Silvers said. Eaton got wins from Wade Monebrake at 138 pounds, KeAnthony Bales (145) Holden Sittloh (195), Skyler Straszheim (220) and Seth Bowman (285). Monebrake won by pin in the third period. He was leading 14-1 at the time of the fall. Bales won by pin in 1:05. Sittloh won by pin at 2:58. Straszheim scored a 7-0 decision and Bowman won by fall in :52. “Now we take the next week and half and we’re just going to focus on the things we need to do to be ready for the league tournament,” Silvers said. Eaton will compete in the Southwestern Buckeye League tournament on Friday and Saturday, Feb. 15-16 at Monroe High School. Wrestling is scheduled to begin at 6 p.m. on Friday. “League this year will be problem for us because we’re giving up two weight classes. 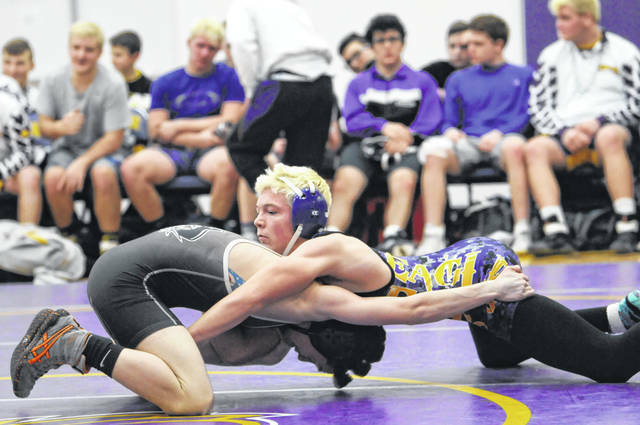 When you don’t have a six (106-pounder) or a 13 (113) that’s a lot of points that we’re not able to score, which will make it tough for us.,” Silvers aid. https://www.registerherald.com/wp-content/uploads/sites/41/2019/02/web1_ehswr1.jpgEaton’s KeAnthony Bales pins his opponent from Covington during a dual match on Tuesday, Feb. 5. Eaton came up short on the scoreboard, falling 39-27.